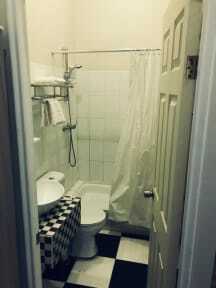 A very nice, quiet and tidy hostel with great showers and kitchen facilities. Located on a beautiful street, a short walk to the train station which connects you to bus stations and within walking distance of the Plaza De Armas. Super friendly, helpful staff and breakfast is decent. Wifi connection not great but everything else was perfect! Loved our stay in the dorm room here! It was lovely and bright with a nice breeze through the window. Comfy beds, breakfast provided even though we had to leave very early in the morning and great staff! It’s a lovely house on a cute street right next to a lovely park! Really enjoyed our stay, it’s a peaceful and quite place, very relaxing! As the other comments were saying, very quiet place, perfect for a good quiet night. Nice staff, good breakfast. Quiet street close to the metro. If you're looking for a party place it didn't sound like the best place. The hostel is large and my room was tucked away in a quiet area of the building. The facilities were good. I stayed here for the laundry facilities and ended up paying 6000CLP to do one load! Good facilities, good value for money and a clean place. Staff is ok and helpful and there is a small breakfast. Compared to other hostels there is less of an atmosphere, this place is more in between a hostel and hotel I think or if you like a more peacefull stay. Location is ok, a bit away from Bellavista, but not more than 5 minutes compared to other hostels. I stayed in the female dorm and I thought it would be fun to be on the top bunk of a three-tier bunk-bed. How wrong was I? The bed wobbled everytime I climbed up and I didn’t feel safe. Also there was only 6 lockers for 8 people. The room was too small I think that room should have 4 beds maximum. The staff were polite. The bathrooms were clean and the kitchen and dining area were clean and well equipped. But I didn’t enjoy because there’s no real friendly atmosphere and the room was too small. We stayed in a 6-bed dorm; Pros - really nice building on a nice street right next to the park, good breakfast (we hadn’t had normal toast in over 4 months!) Cons - dirty sheet and pillow cases, didn’t replace bin bag in toilet, filthy toilet downstairs in the second building, no good communal areas to chill, temperamental WiFi, unfriendly staff (who were very rowdy on Friday night) Overall a really strange vibe and is not as nice as the pictures look. Billed as a boutique hostal, it actually turned out to be just about average. Over-crowded dorms, not enough room to put the bags pretty much sums up the dorms. The rest of the place is a joke. The common room is a couch at the bottom of the stairs and a table with four chairs. The kitchen is totally taken over by the staff including its volunteers. The hostal is here for the staff, not the paying guests. Not a reccommended hostal. The staff was very confused, the WiFi didn’t work and the bathrooms were not the cleanest.